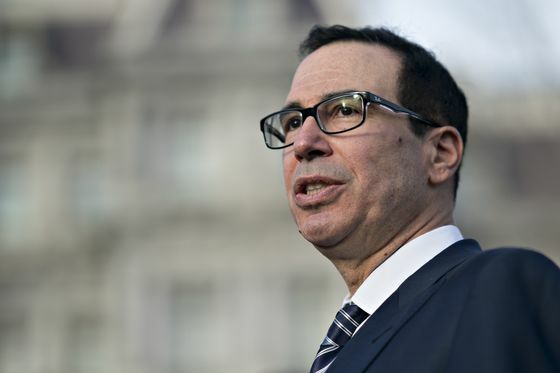 (Bloomberg) -- Treasury Secretary Steve Mnuchin will head the U.S. delegation to the World Economic Forum in Davos, after President Donald Trump scrapped his trip to the annual gathering because of the government shutdown. Secretary of State Mike Pompeo, Commerce Secretary Wilbur Ross, and U.S. Trade Representative Robert Lighthizer also plan to still attend the forum, according to a statement Tuesday from the White House. The president’s deputy chief of staff, Chris Liddell, will round out the U.S. delegation. Trump announced last week that he was pulling out of the conference for global financial elites, tweeting the cancellation was because "of the Democrats intransigence on Border Security and the great importance of Safety for our Nation." The partial shutdown of the federal government -- now in its fourth week -- means that the White House is without many top officials who would normally help prepare for and coordinate such a trip, while Secret Service personnel are working without pay. Trump has limited his travel during the shutdown, scrapping a planned vacation to Florida - though he has left Washington to visit the presidential retreat at Camp David, visit troops in Iraq and Germany, tour the U.S.-Mexico border, and address a farming convention in New Orleans. Skipping the Davos summit will deprive the president of a key opportunity to sell some of the world’s most influential businesspeople on his efforts to renegotiate trade deals and draw manufacturing back to the United States. Trump delivered the keynote address at the 2018 iteration of the Davos conference, where he argued that "now is is the perfect time to bring your business, your jobs, and your investments to the United States.” Trump -- the first U.S. president to attend the summit since Bill Clinton -- also held a private meeting with corporate leaders.